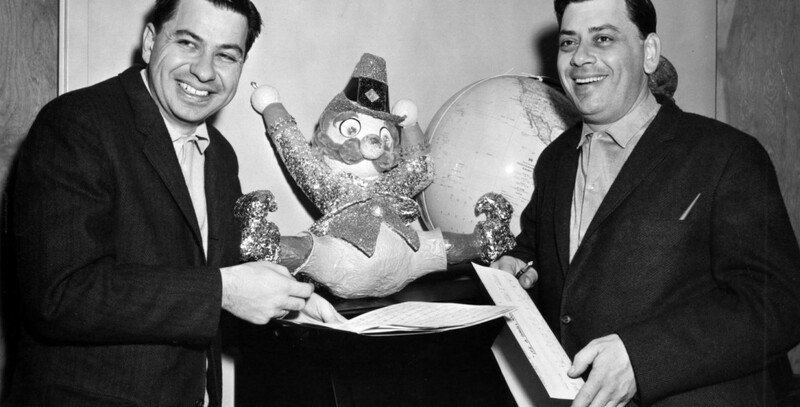 Home / Disney A to Z / S / Sherman, Richard M., and Robert B.
Sherman, Richard M., and Robert B.
Sherman, Richard M., and Robert B. Songwriters; known primarily for their Disney work, they first wrote pop songs for Annette Funicello, beginning with “Tall Paul.” The record sold 700,000 singles. Later they wrote songs for Disney films such as The Parent Trap, Summer Magic, Winnie the Pooh and the Honey Tree, That Darn Cat!, The Jungle Book, The Aristocats, Mary Poppins, The Happiest Millionaire, Bedknobs and Broomsticks, and The Tigger Movie. It was their songs for Mary Poppins that gave them their big break, and two Academy Awards. In all, they wrote over 200 songs featured in 27 films and two dozen television productions, and received nine Academy Award nominations. Some of their most popular songs include “Supercalifragilisticexpialidocious,” “Spoonful of Sugar,” “I Wan’na Be Like You,” and “Winnie the Pooh.” Probably their best-known song was not for a film at all, but for a Disney attraction at the 1964-1965 New York World’s Fair—”It’s a Small World (After All).” Also for the Fair, they wrote “There’s a Great Big Beautiful Tomorrow” for the GE Carousel of Progress. Their last Disney projects were songs for Epcot in 1982. They were named Disney Legends in 1990. In 1992 Disney Records released a special retrospective collection on CD entitled “The Sherman Brothers: Walt Disney’s ‘Supercalifragilistic Songwriting Team.” A documentary, The Boys: The Sherman Brothers’ Story, was released in 2009. They were portrayed in Saving Mr. Banks. Robert passed away in 2012.